We all know that Volkswagen makes a wide range of automobiles such as compact cars, family sedans, SUVs, and the iconic VW Bus (which will be all-electric in its latest iteration), but pickup trucks are not vehicles most people associate with the brand. VW plans to change that perception with the launch of the new Volkswagen Amarok. The pick-up is an attractive vehicle thanks to its exterior design, good all-around visibility, and high-quality interior. Inside, you will find a luxurious interior. Discerning truck enthusiasts will appreciate the Nappa leather seat covers with contrasting Ceramique stitching. The new electrically adjustable ergoComfort seats feature sporty contoured side bolsters that have been optimised to provide maximum comfort and top ergonomic characteristics. The optional electric 14-way driver and front passenger seats can be individually adjusted to suit personal body size. The seat height and longitudinal position can be adjusted at the push of a button, the degree and width of lumbar support can be changed and the backrest and seat cushion angle set. The instrument panel also immediately catches the eye. Doing away with round contours and concentrating on horizontal and vertical lines makes the interior appear more striking and pronounced. The multifunction steering wheel also makes it easier for the driver to operate the radio, telephone or multifunction display. The driver can use the new, optional paddle switches on the steering wheel to control the 8-speed automatic transmission, while the frameless rear-view mirror, in combination with the optional Light and Sight package, heightens the premium look and sporting character of the new Amarok’s interior. Another cool feature is the electric voice amplification. The hands-free microphone amplifies the voice signals so that the driver no longer has to turn to face the back-seat passengers or raise his voice. Passengers in the back seat hear the person’s voice amplified by the rear loudspeakers. The Amarok is powered by a 3.0-litre V6 TDI engine achieves 550 Newton metres of torque and 165 kW / 224 PS. The Amarok can accelerate from 0 to 62 mph in 7.9 seconds and reach a top speed of 120 mph. 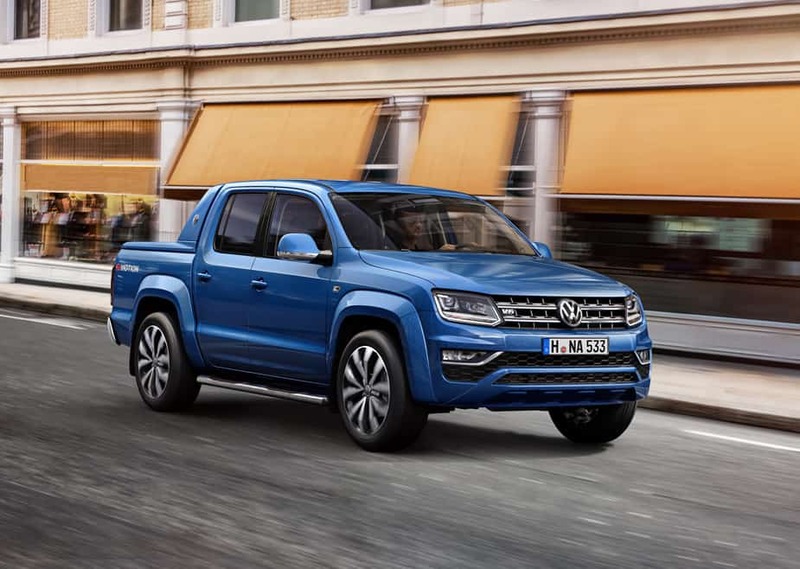 Sales of the new Volkswagen Amarok will start before the end of the year. Unfortunately for US consumers, the pick-up will only be available in European markets.